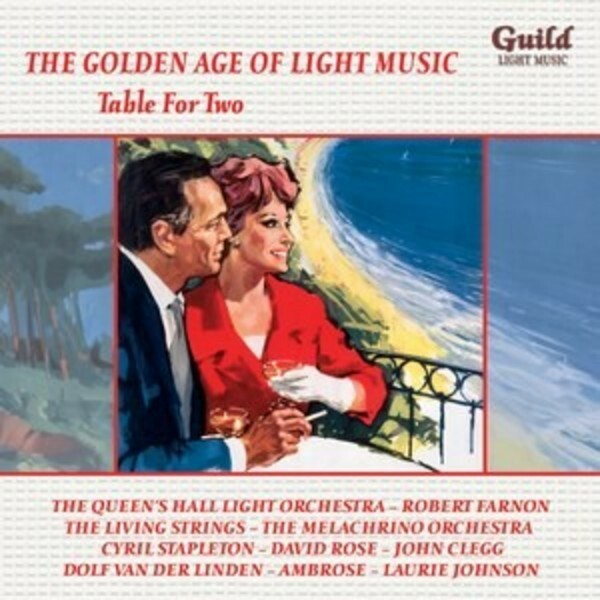 Music for a romantic evening is the theme of this collection which contains a mix of recordings by famous conductors, such as Robert Farnon, George Melachrino, Charles Williams and Cyril Stapleton, interspersed with recordings from the background music libraries that provided so much music for films, radio and television. Well known composers such as Peter Dennis, Cyril Watters, Wally Stott and Bruce Campbell (responsible for the title track) wrote hundreds of pieces, sometimes for more than one library, always hoping that one of their compositions would be chosen as the signature tune of a radio or television programme, thus ensuring a regular income in the shape of royalties. 'Table for Two' was the last CD in the series to be compiled and annotated by David Ades before his death in February 2015. It, and the previous 126 collections, form a fitting memorial to his programming skills, his encyclopaedic knowledge of light music and the exhaustive research he carried out to ensure the accuracy of his definitive booklet notes. Alan Bunting and Guild have decided that the series continues in a similar fashion.